The ACCUDRIVE™ RG Right Angle Precision Servo Drive is the rugged economical solution for automation applications. 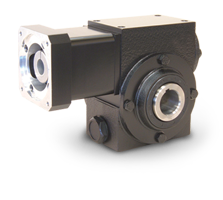 Featuring Cone Drive?s true double-enveloping worm gear technology, the ACCUDRIVE™ RG offers a cast iron universal housing that enables mounting in any position and withstands the most dynamic servo applications. The RG is factory-filled with synthetic lubricant and quality-built in standard and low backlash options with hollow shaft to provide complete flexibility.